When you’re interested in a paint booth installation in Omaha, Nebraska, there’s a few simple things you should know before making the investment. At John Baker Sales, we’ve put together a short FAQ for paint booths so you can be well informed in your decision. 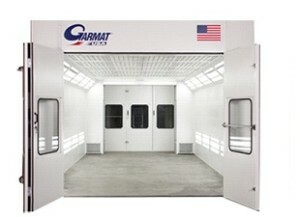 Paint booth installation in Omaha, Nebraska generally takes 2-5 days, depending on the size of the booth. Some automotive paint booths can take 1-2 weeks to install, again depending on their size and complexity. How Often Should I Change My Paint Booth Filter? The best time to change a filter is when the fan can no longer overcome the static pressure and many paint booth manufacturers recommend you change them after a certain number of operating hours. Where Can I Learn to Maintain My Paint Booth Myself? At John Baker Sales, we offer an extremely useful maintenance program for all of our customers. This program includes information on how to spot and fix minor issues, reduce breakdowns and improve performance, and how to work to keep your equipment operating smoothly at all times. What if I Want to Upgrade My Paint Booth? If you’re looking for equipment upgrades such as adding a bake or standby cycle, we can install whatever additional equipment you desire. To receive a quote on these upgrades, give us a call at 888-912-6684 today!